Our 2019 tournament is scheduled for Saturday, August 4. We are working hard to make this year's tournament is even better than the last year's. In July 1995, we had an open Saturday and didn't want to waste it and that's how this tournament was born. The tournament is named after Greg "Boo Daddy" Claypool since he provided his pool for the inaugural after party. We want all ruggers to have a good time so this tournament welcomes those 300 pound, out-of-shape, breathless, beer-guzzling props just as much as those speedy gazelles who look forward to 7s season. As Boo is the epitome of a non-7s rugger, the name stuck as a way to remind us everyone is welcome at this tournament. 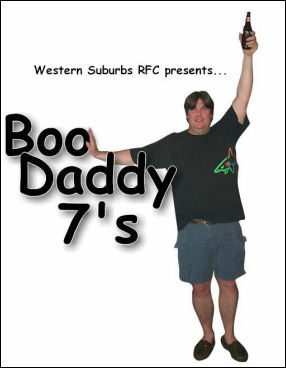 On August 3, 2019, Western Suburbs RFC invites you to play in the Boo Daddy's 7s Harlotfest Tournament. $30 will buy your ticket into this rugby harlotfest. While registration is done individually, you are welcome to bring your whole team with you. Teams are selected randomly on game day; the heaviest person on the team is the team captain. If you're into watching, It's just $15 and you'll also get beer with that too! Registration: If not pre-registered, registration will open at 7:30am ET Saturday August 3, 2019 at the Morven Park Athletic Fields. Pre-Registration: If pre-registered, enter the welcome tent to sign in. Pre-registration will close August 2, 2019 at 12pm.